Calum Ferguson (number nine) lines up for Cascadia ahead of their match against Ellan Vannin. Picture: Alvaro Velazquez. Calum Ferguson has swapped the north of Scotland for the World Cup – just not the one in Russia. 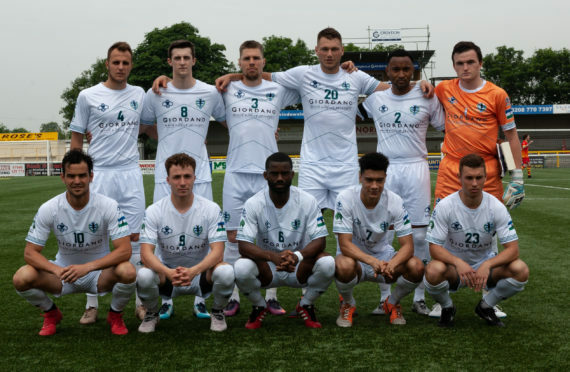 Ferguson is playing in the Conifa World Cup in London, a tournament for minor states and territories not recognised by Fifa, for Cascadia, a region which represents the states of Washington and Oregon in north-western United States and the Canadian province of British Columbia. As a former youth international with Les Rouges and with his mother Margaret being born in Canada, Ferguson was contacted by Jack Thorpe, a scout with Wolves who was helping organise teams for the tournament, with regards to representing Cascadia. The players had not played together or even met prior to joining up ahead of the tournament, which started on Thursday and is being played across 10 non-league grounds in Greater London and Berkshire. Their first international was on Thursday and Ferguson played in the 4-1 defeat to the Isle of Man. They face Barawa – a Somali diaspora team based in London – today and play their final Group A fixture against Tamil Eelam, a side representing Sri Lankan Tamils in the UK, Canada and Switzerland, on Sunday. The opportunity to play at a World Cup appealed to Ferguson, who has just left Elgin City and is planning to move out to Canada at the start of next year. He said: “I got an email from Jack saying I was eligible and asking to take a look and see if I fancied it. It is in the off-season and a chance to put myself in the shop window – I’d rather be playing football than on holiday. “I had heard of the region before but wasn’t aware they had a team. It’s a good bunch of boys and I’m glad I came along – it’s not really what I expected but everything is done properly. Ferguson (nine, centre) in action against Ellan Vannin. “There are different regions and minorities that are looking to have football in their area and it’s a celebration of the sport. It provides a platform to play against people from all over the world. My mates didn’t believe me when I said I was playing in the World Cup. Among Ferguson’s Cascadian team-mates is James Riley, who has played over 250 games in the MLS for New England Revolution, Seattle Sounders, Chivas USA and DC United. Three MLS teams – Vancouver Whitecaps, Portland Timbers and Seattle Sounders – are based in the Cascadia region and their head-to-head results are compiled annually to determine the winner of the Cascadia Cup. It has been a perfect networking opportunity for Ferguson, who is on the lookout for a new club in the six months before he departs for Canada.